A Yogi in My Garden! A yogi visited my garden and she took over! Don't ask me about Yoga, I don't know anything about it except that it looks "too relaxing" to activate weight loss. I picture people posing in uncomfortable positions as they try to focus on their breathing. What do I know from Yoga? I always say, "when I reach my weight goal, I'll take a yoga class and relax. I have a friend named Hilary Lindsay who is a Master Yogi/Guru to the stars, professional athletes and regular folks in Nashville, Tennessee. Hilary is a walking promo for the benefits of this ancient discipline. Her brand of yoga is called "Active Yoga" and she dares anyone to call it a mere "stretching class," unless that definition includes the mind, body and soul! The lady looks amazing and when she came to visit me in Los Angeles last week, we spent a lot of time together in my garden. Man, did we spend a lot of time in my garden! And she took a lot of deep breaths too, as if she was inhaling in every fragrance, every color, the very soul of my garden! I wanted to tell her to "leave some of that air for me!" We talked about our lives, stopping occasionally to answer questions about "how to root succulents" and design considerations when transitioning from a dry garden to a lush, water garden. Shaded by the canopy of a fragrant apricot tree, we stopped to enjoy the moment and each others company. Hilary seemed to be "at one" with my garden and I could only imagine that this was a mindset that she had cultivated with yoga. There are many elements of my garden that were contrived to create a mood, take advantage of sun patterns and play up contrasting textures and colors. Hilary seemed to notice them all and was generous in her praise and appreciation. 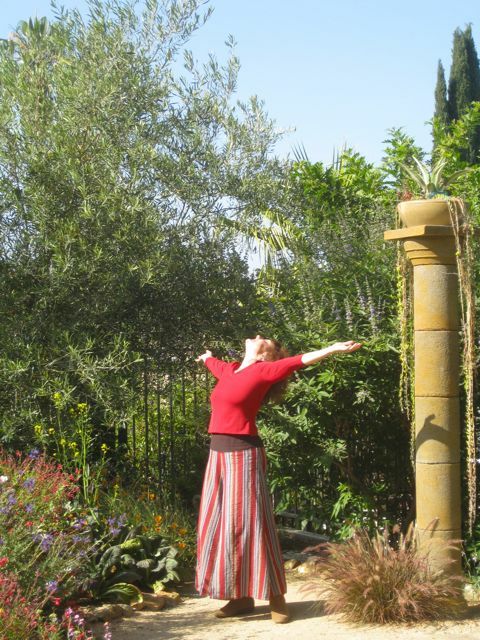 A free spirit, Hilary was playful in my garden, turning, bending and reaching her hands to the sky as I took her picture. 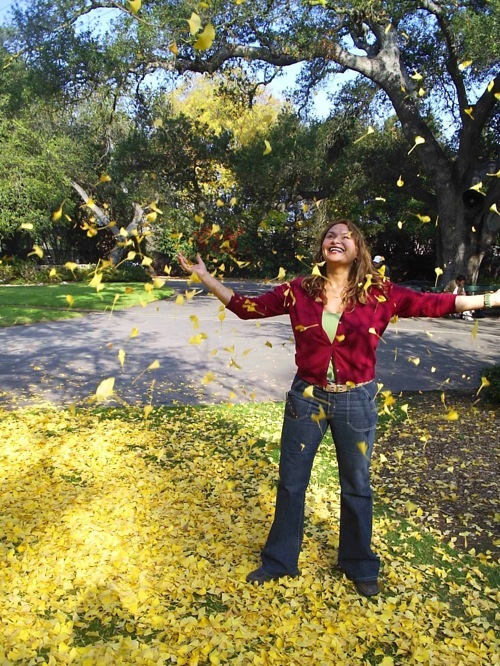 I realized that if my garden were a person, it would be a lot like Hilary. Natural but not ordinary, vibrant and soothing, kinetic, yet still. My garden has the same effect on me! Does your garden reflect who you are too? Nice to meet you! Thanks for reading and commenting. You must have a great job as a photographer! Do you also do yoga? I thoroughly enjoyed what you posted and it rings true to my own nature. I enjoyed the poses, the peace and synergy of your picts. I am happiest when photographing outdoors, whether landscape, architecture or products and lose track of time. It is the most awesome feeling one can have. It is wonderful to know that there are others that get this. I think that if people took the time and money to create a space like this for themselves and their family, the world would be better off. They would have a place to reconnect, get centered, and breathe. Thanks for asking. What is your website or blog? Do you mind if I post an extract from your content on my site, I will put a link back to your blog? Your post has caused me to revisit a topic I often contemplate, namely, how much about people we would be able to extrapolate from viewing their ideal landscapes. I specify “ideal” because their current landscapes, for whatever reasons, might not fully reflect their personalities. For instance, a current landscape might be merely a work in progress; or it might serve a particular function, temporarily; or the means to create an ideal landscape might be lacking for the present. In all such cases, it would be inappropriate to infer much about their owners from the landscapes in question. But in a few cases, when talent, will and means come together to form an ideal landscape, we are afforded a glimpse into its author’s soul. Speaking of authors, Edgar Allan Poe penned a wonderful piece on the creation of an ideal landscape in “The Domain of Arnheim.” It’s interesting reading for someone who wishes to dream and push the concept of “ideal landscape” to its extreme. It sounds like you two had a lovely visit – in a lovely setting. It’s relaxing just seeing Hillary soaking up your garden. P.S. Shirley, I’m more of a house person on the blog… but I’m an enthusiastic (not gifted) gardener. I hope one day to create a balance between my inside and outside spaces so that they are both equally welcoming. 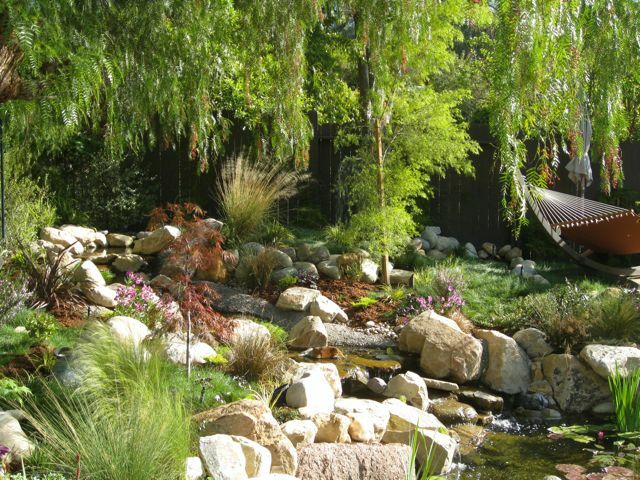 Your blog is a great inspiration to me – I love that shot of the hammock near the water garden. Just beautiful.